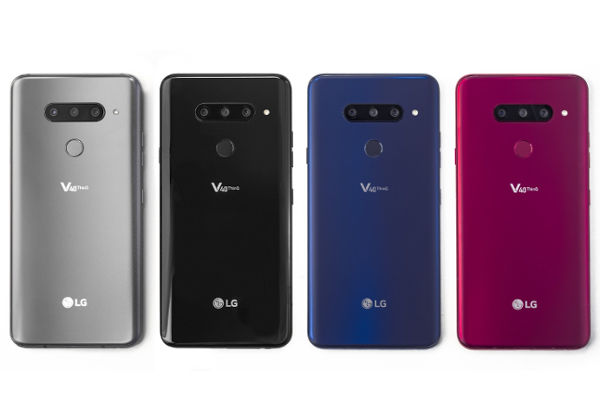 LG V40 ThinQ goes official with 6.4-inch QHD+ OLED FullVision display and Five cameras. LG today unveiled its newest premium smartphone featuring a total of five cameras. The latest iteration of the company's acclaimed V series, the V40 ThinQ retains the V series design philosophy with an improved 6.4-inch FullVision OLED display and even slimmer bezels than before. The LG V40 ThinQ sports a new and improved 6.4-inch QHD+ (3120 x 1440) OLED FullVision display and a bottom bezel that is 1.6mm thinner than its predecessor. The new plastic OLED display is designed to deliver more accurate colors and better luminance consistency. The 4.5 million pixels delivered by the OLED display is the most of any QHD+ smartphone on the market today. Powered by the Qualcomm Snapdragon 845 Mobile Platform paired with 6GB of RAM and 64GB or 128GB of internal storage. The phone will be available in the charming colors of New Aurora Black, New Platinum Gray, New Moroccan Blue and eye-catching Carmine Red. The V40 ThinQ is the first LG phone to carry the Audio Tuned by Meridian label. The 32-bit Hi-Fi Quad DAC produces a balanced sound signature that comes extremely close to the quality of an original recording. And Boombox Speaker, originally introduced on the LG G7 ThinQ, doubles the bass of conventional smartphone speakers by utilizing the internal space of the device as a resonance chamber. When placed on a solid surface or hollow box, the LG V40 ThinQ acts like a woofer to amplify the bass even more. LG designed the V40 ThinQ from the ground up to deliver a unique smartphone camera experience. The LG V40 ThinQ features a rear camera module with three different lenses: 16MP super wide-angle, 12MP standard angle and 12MP telephoto. The three lenses allow for shutterbugs to frame different shots without changing position relative to the subject. The 107-degree super wide-angle lens captures subjects with more of the background with ease, while the telephoto with 2x optical zoom (or 3.2x the zoom of the wide-angle lens) takes clear shots from distance without a loss in image quality. The Triple Shot feature stitches together the images captured with each of the three lenses into a short video file for easy sharing. Dual PDAF (Phase Detection Auto Focus) delivers automatic focusing that is 50 percent faster, about twice as fast as the industry average. The advanced HDR feature analyzes and determines the right exposure settings to create perfectly lit shots, eliminating overexposed backgrounds or underexposed subjects. Subjects are always in perfect focus because the camera checks sharpness continuously until the shutter button is depressed. LG upgraded the camera in the LG V40 ThinQ to be even more powerful and intuitive than ever to deliver the best color, composition, white balance and shutter speed. The AI CAM's new AI Composition feature taps into the phone's intelligence to frame, capture and recommend an alternative shot to the one taken by the user. AI Auto White Balance (AI AWB) automatically adjusts the color temperature across different lighting situations while AI Shutter selects the right shutter speed, especially useful when trying to capture fast-moving subjects. Other new features such as Cine Shot, 3D Light Effect, Makeup Pro, Custom Backdrop, My Avatar and AR Emoji make photography on the LG V40 ThinQ a whole new experience. Cine Shot makes creating cinemagraphs - images with animation - incredibly easy and fun. Simply shoot a short video with any of the phone's three rear cameras and "paint" the area to be animated with a finger and the result will be sure to amaze. 3D Light Effect changes the tone of a photo with professional-looking lighting, touch up any selfie with different looks using Makeup Pro or entirely change the background of a selfie with Custom Backdrop. For those who love all things augmented reality, create and share personalized emojis with My Avatar and AR Emoji using one's own face or one of the provided characters. Pricing and additional details of the LG V40 ThinQ will be announced locally at the time of availability.